Homeopathic medicines can be used to treat acute or constitutional conditions. The remedies are made from substances from nature: animal, vegetable or mineral. The substances are then potentized according to the rules set by the Homeopathic Pharmacopea of the United States. There are numerous remedies that are used to treat itches in homeopathy. Rhus toxicohendron is made from the poison ivy plant. Known to cause itching, this plant, when prepared homeopathically, can be used to cure itching. The type of itch best treated with homeopathic Rhus tox is one with eruptions that burn and are moist. and the pains are worse when touched, according to Boericke's "Materia Medica." According to the University of California at San Diego (UCSD), homeopathic sulphur is useful for people whose itches are worse when they are warm, as when they climb into bed, and after being wet or bathing. This remedy is also good for treating eczema that has been suppressed with ointments, but still remains. Hepar sulf is used to treat itches in people who are chilly and sensitive. For infected eczema, Hepar sulf can be useful, according to UCSD. The itch best suited for treatment with homeopathic Arsenicum album is from dry skin that is worse from itching but better with heat, for instance, a hot pad. The person needing this remedy can be very anxious, nervous and restless, according to Boericke's "Materia Medica." 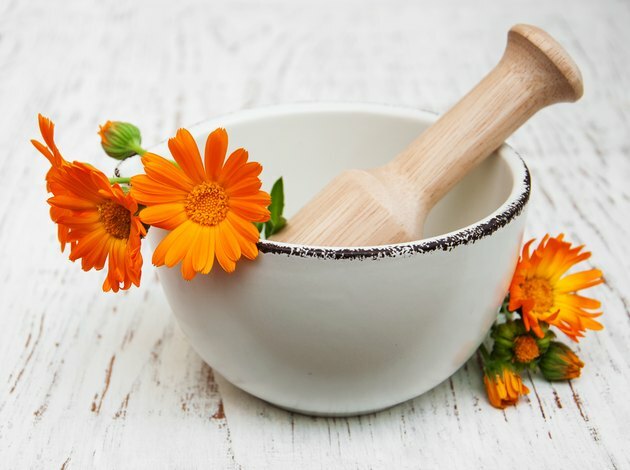 Calendula is used by homeopaths in both homeopathic potencies and in tincture or ointments to treat itches without suppressing them. This remedy is useful for infected itches or to prevent inflammation and infection. Homeopathic remedies are sold over-the-counter in many health food and specialty food stores. Doses available are 6c and 30c. One dose of either potency can be taken every few hours. No food or water should be taken within 15 minutes of taking the remedy, as it dissolves under the tongue and goes directly into the bloodstream this way.